Recently I wrote a post about dealing with the noise, busyness and general chaos of the Christmas season. Our involvement in the many worthwhile activities of decorating, cooking, entertaining, party-hopping, buying and wrapping gifts, sending cards, volunteering our time and treasure to charities, and spending time with our families can make our heads spin. I proposed that a renewed focus on the season of Advent, with its call to simplicity and quiet, would make a wonderful antidote. A reader responded with an unexpected comment: “I have the opposite problem. I would love a bit of noise and chaos at Christmas.” Jay described her situation of caring for a homebound mother and a disabled husband, with other family members living too far away to visit. Suddenly my assumption that a quiet Christmas was best for everyone felt arbitrary. “Quiet” can assume many forms, including loneliness and isolation. I immediately wrote back to Jay, attempting to offer some consolation; I wanted to do something to mitigate her circumstance. In the writing I realized that I too understood the ramifications of a Christmas “gone quiet.” My own family circle has grown noticeably smaller over the years with my parents gone and my sister, brother-in-law and nephews scattered across the country. Although the circumstances were different, Jay and I ended up sharing a common problem. Jay responded to my letter, opening up about her situation. Because of her husband’s disability, it is nearly impossible for them to visit friends. In fact, in order to see her mother on Christmas day, she has to leave him behind. She waxed nostalgic on the past, writing, “we had such a lovely time with the cousins and aunts and uncles when I was a child, and when we lived closer by.” She wrote of longing to help others, of getting a tree only to leave it unadorned and of the futility of buying gifts when no one really needed anything. She gently berated herself in her longing for Christmases past full of Santa Claus, gifts and overeating; as a teacher in the Methodist church she is keenly aware of the true meaning of the day. However, as we continued to write back and forth, I noticed her mood quickly shifting from laments to gratitude. 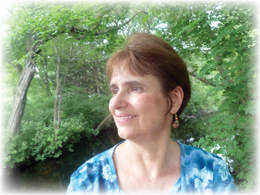 Jay began recounting her blessings, most notably the love she has for her husband and mother. I could feel the warmth of that love coming across the Atlantic from her home in Ipswich, England to mine in North Grafton, Massachusetts. It was then that I began to understand the power behind listening. I had entered into the correspondence assuming my usual role of problem solver; I was going to make everything better! It soon became clear however that I was meant to be a friend; to listen to and acknowledge another person’s life story. It was not about me solving a problem and looking like a hero; it was about Jay needing someone to be fully present, listening with mind and heart. Paying attention to her life rather than mine required humility. Yet, once I surrendered to the idea, I could see God’s grace unfolding. The focus of our letters changed from melancholic remembrances to gratitude for the blessings we both enjoy. Gratitude fueled action with Jay vowing to get into the spirit by attending a couple of get-together lunches and taking in a local concert of carols presented by her town’s brass band. I, in turn, volunteered to join a band of Christmas carolers in our parish, and inquired about taking communion to nursing home residents. Jay and I are exchanging gifts through the mail. Listening has turned strangers into friends. Our correspondences caused me to examine myself: why do I insist on giving people what I would not want for myself? When I share my heart with someone, I don’t want judgment or unsolicited advice or easy answers. Many problems cannot be solved but rather, must be endured. I just want a sympathetic ear. Doesn’t it make sense then that sometimes my family and friends, neighbors and even strangers just want someone to accept where they are at that very moment and sit close by, saying nothing? I experienced this recently as another friend shared with me the pain of watching her best friend slip away behind the fog of dementia. I empathized, recalling my mother’s mental deterioration and personality change, but decided that it was best just to let her talk. We ended our conversation in silence, looking at each other with misty eyes. Jay taught me how to do that. For listening is one of the most precious gifts we can give to each other. Note: It turns out Jay and I have something else in common–Foster Dad John’s Critter Room! I never realized how powerful a virtual community can be. Thousands of strangers pulling together because of a single passion. I never dreamed that one person’s willingness to be generous with his gifts could have such an impact. This weekend I was privy to something extraordinary which made me proud to be a part of this community. 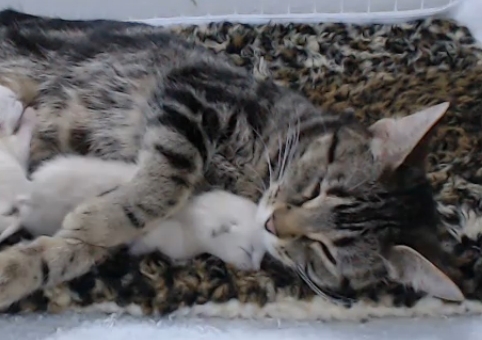 Over a year ago I was introduced by a friend to kitten cams. Any time of the day or night I could indulge in my love of kittens. I’ve watched them being born, nursed, bathed by their mother (we regulars call it “baffing”) and snuggled. They race around the room (aka “zoomies”) and tumble over wrestling with each other. I’ve laughed out loud at their antics, fallen in love and gushed over them with fellow chatters. I’ve cried on adoption day because of all the wonderful people who take them to their hearts. Many of the new owners post Facebook pages with pictures, videos and updates so we can all keep in touch. All have large followings. There is nothing on television that beats it because this is real life, playing out uncensored. In the course of nine litters I have witnessed beautiful stories of generosity, healing and friendship, not just towards kittens but towards humans as well. I have witnessed an outpouring of stunning creative efforts from drawings, paintings, photography and anime to quilts to original stories and poetry (even some a la Dr. Seuss!). 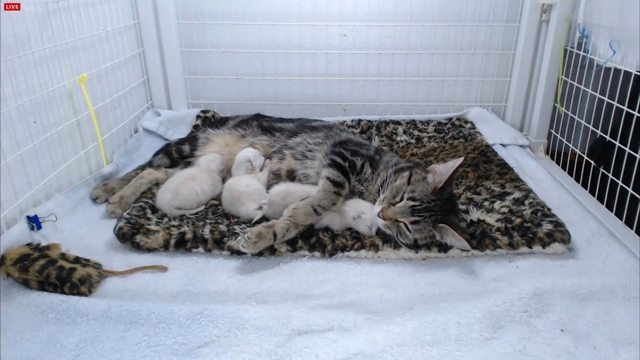 It began with the 7kittens cam; when those kittens were adopted I was referred to The Critter Room by chatters on 7kittens (see previous post). It’s been a love affair ever since. 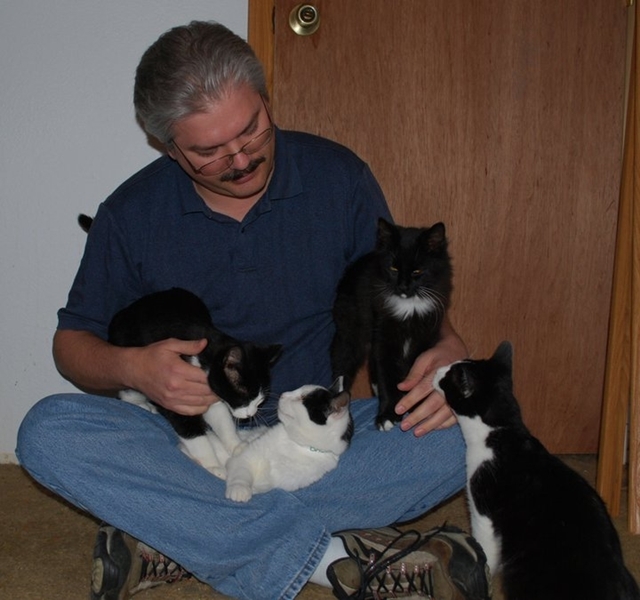 John Bartlett, aka “Foster Dad John” runs the Critter Room and is a volunteer for Purrfect Pals in Arlington, WA. He has fostered an extraordinary forty-one litters, adding some fun by having themes attached to litters (such as names of scientists, Mythbusters characters and now, the Ghostbusters in honor of the late Harold Ramis). It may all seem to be sweetness and light watching adorable kittens nurse, mew, wrestle, zoom around and play. But as I discovered this weekend (and as Foster Dad John has warned in the past), a 24/7 view is uncensored; you get the bad along with the good. The Ghostbuster kittens were born on February 25 at the shelter after the mother, Janine, was rescued off the streets. Critter Room fans were delighted to see three creamy white siamese kittens dubbed Ray, Egon and Peter. Peter in particular was very active for a newborn, taking trips around the kennel cage and being quite vocal about it. He immediately won the hearts of the over one thousand people who tuned in daily to the cam. There were concerns however that he was burning off all the calories he gained because of his constant motion. John was supplementing him with a bottle and created a box for the nest of kittens as a means of confining Peter and keeping him close to his mother. This past Saturday I tuned in for a peak and saw Peter escape from box. His cry was loud as he moved rapidly around the cage. At first it seemed funny, just another Peter antic and most of us did not suspect any trouble. Janine went to retrieve him and held him close; his cries subsided and we began to relax. John had been monitoring the situation and came in to feed him. After he removed Peter from the nest he did something unusual: he reset the cam. This would, in effect, wipe out the last twenty four hours of footage. We would soon know the reason. Several minutes passed and we assumed Peter was nursing from the bottle until John, in his steady quiet voice, announced some bad news: Peter passed away in his hand. The chat room went wild, comments flashing by. Was this a joke? John’s subsequent reaction to Peter’s death confirmed that this was no joke. Normally calm and self-possessed, this man wept over the death of this little kitten that he tried so hard to save. He knew the little fellow was in trouble the minute he picked him up which was why he reset the cam. Peter’s romp around the cage and his cries had been because he had taken milk into his lungs and was dying. John was fortunately not seen on the cam but he remained with Peter for a long time. We could hear him softly weeping, hoping against hope that Peter would move. He commented that Peter’s ears had started to darken. He eventually encouraged Janine to come out and sniff the body so that she would know the awful truth. Over a thousand of us witnessed the episode and we were beside ourselves. I was sobbing, first over the death of this sweet and funny kitten, and then over John’s reaction. This was a man who has been totally professional from the get go. He has never bought into the adulation from his fans; he was there to do a job, saving cats and kittens and giving them good homes. His cam is meant not just to entertain but to educate. He rarely showed overt emotion or favoritism towards particular kittens. And now he was openly weeping. The outpouring from the community of over 35,000 followers of The Critter Room was immediate and overwhelming. Posts on Facebook appeared in record numbers offering sympathy to John and gratitude for everything he had done. Donations to Purrfect Pals in the memory of Peter poured in. We consoled each other, sharing memories of little Peter and stories of special cats in our lives. Many of the creative people in the community contributed original stories, poetry and paintings. Later in the day John came back on the cam to explain what had happened to Peter. He and the Purrfect Pals staff had known Peter was at risk, possibly because he was born prematurely and did not have mature lungs (explaining why he aspirated on his mother’s milk). His frantic behavior most likely was a demonstration of his trouble (although John commented that Peter was one of the most vibrant and energetic kittens he had ever seen, making his passing all the more inexplicable). John went on to say that he and the staff don’t always share their concerns with the viewers to prevent needless worry and speculation. Out of forty-one litters, Peter was the first kitten John ever lost. His calm voice and clear explanations were like a balm on the community. We knew he was okay. Nature had to take her course but not before Peter left his indelible mark on the hearts of thousands around the world. As did his foster dad. I mourned with this community, haunted by what I had seen. I also shared in the comfort provided by the foster dad who, although he was hurting the most, maintained the courage to share his grief with strangers. The time he gave in explaining Peter’s passing and the risks of fostering gave me great solace as I am sure it did for many others. John is a wonderful example of generosity. People balk at the idea of spending so much time saving animals, thinking that perhaps the efforts and monies raised should go towards people. I have witnessed the effects of John’s gifts of time, wisdom and love on members who are sick, homebound, out of work, or who have lost loved ones. Many have lost their own beloved cats and find comfort in the antics of growing kittens, and in the caring community. 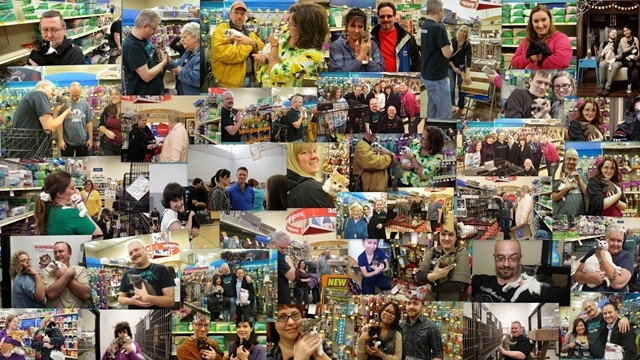 Members comment that their faith in people has been restored through being a part of the kitten cams. The chatters’ humorous reactions to the kittens and their antics have brought much needed laughter into my life. I start each morning at the crack of dawn checking Facebook updates, smiling at the posts from owners of Critter Room alumnae. I sneak peaks at the cam during my work day. I think of a volunteer out in Arlington, WA who because he dared to share his gift with the world, has brought joy, solace, profoundly moving moments and a slice of real life to the virtual world. We should all be that daring. Think of the world would be like if we were.